interviewed her last year for our Rocky Mountain Chapter Newsletter. It was Alicia’s influence that sparked my interest and fascination in artists’ books. She is a champion for book artists and has done much to educate people about this art form, through her Abecedarian Gallery, the teaching and talks she gives throughout the country. 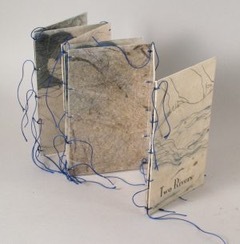 One thing I like very much about artists’ books is that they can be a very intimate expression of oneself, so very personal, or they can be whimsical and just plain fun – but they always tell a story. Like most art, they have the power to touch people, and be a seed in one’s transformation. I love interesting and interactive structures, and I found that I was most enamored with the nature themes. I love Alicia’s artist book Two Rivers. She calls this a meander book structure. It incorporates blue threads in the sewing structure that remain attached and flow away from the book. The pages are beautiful earth-colored etchings under mica that include the text from Sam Hamill’s poem Mountains and Rivers without End. I feel a connection to the movement of water in nature – and feel it inside me as I move through life. My other favorite book in the exhibit was Forest Foraging. Alicia built a Plexiglas box, inserting narrow beakers that hold plants gathered from the forest. In the center of the box is a scroll, made of what looks like parchment paper with etchings of plants, emerging through an opening in the top when a knob is turned. I think about why these two works moved me so. Perhaps they both touch on cherished childhood memories where, with my dog, our playground was the forest and pond. I was in my happy place. I thoroughly enjoyed the exhibit, feeling like a child eager to discover new things. First, I looked at all the artists’ books, and then I read the notebook that provided an explanation of each work. I wanted to walk through the exhibit again, so I could see each book as it connected to Alicia’s story, but I ran out of time. I wish I had held the notebook with me as I viewed the books from the start. Every piece in the exhibit is intriguing, but when I discovered the story behind each one, I was further captivated. I enjoyed this review. I also love rivers and natural forms, having grown up on the St. Mary's River that connects two Great Lakes--Superior and Huron.